I was the kind of kid who loved to take my toys apart to see how they worked. By age twelve, I became intrigued with wind-up phonographs and soon my interests expanded to encompass antique clocks, vintage radios, brass cash registers, antique cars and other fascinations. The skills I cultivated in my machine restoration now enhance and inform my paper engineering. 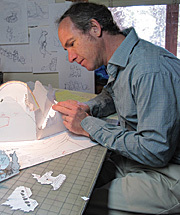 I bring excitement, attention to detail and mechanical expertise to the world of pop-up books and cards. My experience includes everything from creating original paper designs and functional engineering, to editorial, pre-press production, production consulting, cost-reduction refinements and manufacturing support.